A bald eagle that was brought in from Southern Maryland to City Wildlife, in D.C., Tuesday afternoon with lead poisoning has died. 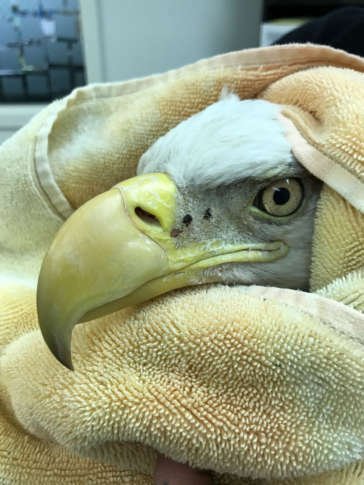 UPDATE 12/07/17 10:08 a.m.: A local wildlife rehab center reports that the bald eagle that was brought in for treatment for lead poisoning Tuesday night has died. Paula Goldberg, Executive Director at City Wildlife says that while it was clear the eagle had lead poisoning, there may have been other issues as well. WASHINGTON — The phone rings inside the building on Oglethorpe Street in Northwest D.C.
Paula Goldberg answers the phone. She’s the executive director of the nonprofit, which takes care of animals ranging from orphaned possums to stranded box turtles — even a trio of pigeons who were somehow evicted from their nests a little too soon. The latest arrival is a bald eagle that was brought in from Southern Maryland on Tuesday afternoon. The big raptor was found on the ground, his feet splayed out at an odd angle. Even before she drew blood from the big bird to figure out what the problem was, City Wildlife clinic director and veterinarian Kristy Jacobus suspected she was looking at a case of lead poisoning. “When it came in, the main thing we noticed was that he was sitting kind of weird,” Jacobus said. Normally, an eagle or another raptor would be standing up straight, feet flat, or talons grasping at objects. Instead, this bird, which was otherwise bright and alert, was sitting back, feet out in front of him, and wings opened to support his weight. Treatment for the eagle will include a process called chelating — giving him agents that will bind to the lead and, in a sense, leach it out of the bird’s bloodstream. City Wildlife said the eagle came from the Nanjemoy, Maryland, area. It’s not Freedom, Justice, Mr. or Mrs. President or any of their offspring — the best-known bald eagles in the D.C. area. It’s not clear exactly how this eagle ingested the lead, but Jacobus says that since eagles scavenge, they often ingest lead from animals such as deer that have been shot. Waterfowl often ingest lead from sinkers used by anglers. Wildlife experts often urge anglers to use non-lead sinkers and recommend that hunters use ammunition that doesn’t contain lead to protect the raptors that often feed on carcasses. While the eagle rested in an area of City Wildlife where he could be kept calm and quiet, the phone rang again: A Great Blue Heron got tangled in some rope. Jacobus and staff members prepare for the next case, which, she said, will probably require protective eyewear.